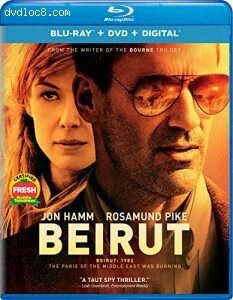 Synopsis: Jon Hamm as Mason Skiles, a former U.S. diplomat, who gets sent to Beriut to negotiate a swap for the release of a terrorist leader, believed to be imprisoned by Israeli secret police, in exchange for a CIA agent who has been-kidnapped. Confronted by ghosts from his past, Mason faces a formidable question: Who do you trust in a world where the truth emerges only when it's copnvenient - or profitable? From the writer of the Bourne trilogy, this taut action thriller also stars Rosamund Pike and Dean Norris and is being hailed by critics as "tense & ever- twisting" (Richard Roeper, Chicago Sun-Times).